According to EIA’s Electric Power Monthly, total U.S. net electricity generation fell slightly (down 1.5%) in 2017, reflecting lower electricity demand. 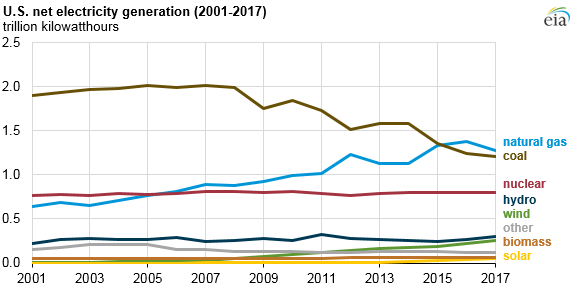 Natural gas and coal generation fell by 7.7% and 2.5% from 2016, respectively, as generation from several renewable fuels, particularly hydro, wind, and solar, increased from 2016 levels. Although natural gas continued to be most-used fuel for electricity generation for the third consecutive year, natural gas-fired electricity generation fell by 105 billion kilowatthours in 2017, the largest annual decline on record. Coal-fired electricity generation also fell, but to a lesser extent, marking the first year since 2008 that both natural gas- and coal-fired electricity generation fell in the same year. Coal-fired generation accounted for more than half of the electric capacity retired in 2017, with 6.3 gigawatts (GW) of the 11.2 GW total. For the first year in at least a decade, no new coal-fired generators were added. About 4.0 GW of natural gas-fired capacity was retired in 2017—most was steam turbine units. However, more natural gas capacity was added than retired, widening natural gas’s lead as the largest source of generating capacity in the United States. About 9.3 GW of new natural gas-fired generating capacity came online during 2017, 8.2 GW of which were combined-cycle units. Electricity from renewable sources, especially wind and solar, continued to increase in 2017. Wind made up 6.3% of total net generation, and utility-scale solar made up 1.3%—record shares for both fuels. In part as a result of record precipitation in California, hydroelectricity increased in 2017, accounting for 7.5% of total net generation. 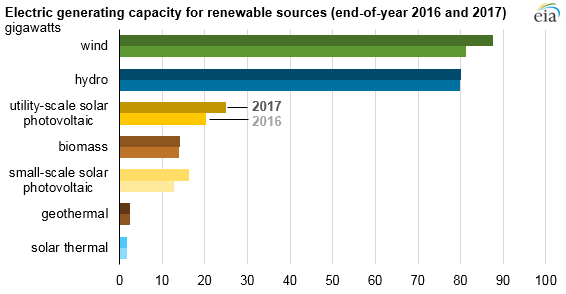 EIA’s latest Short-Term Energy Outlook expects hydro to continue to exceed wind in 2018, but wind is projected to become the predominant renewable electricity generation source in 2019. Nearly 6.3 GW of wind turbines and 4.7 GW of utility-scale solar photovoltaic systems were added in 2017. For each technology, about a third of the year’s capacity additions came online in the last month of the year; these December additions had little effect on 2017 annual generation values. Another 3.5 GW of small-scale solar capacity came online in 2017, increasing total small-scale solar capacity to 16.2 GW and surpassing biomass capacity, which ended 2017 at 14.2 GW. More information about the U.S. electric power sector is available in EIA’s Electric Power Monthly.